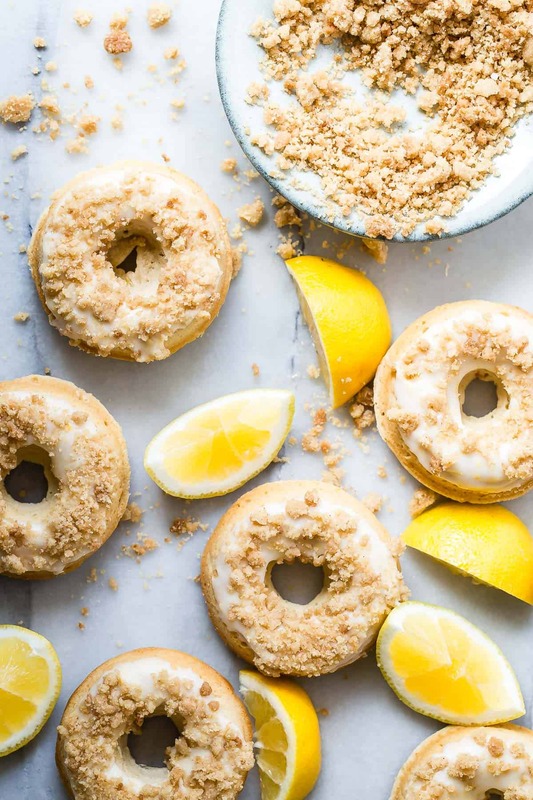 These baked Lemon Donuts come with little to zero cleaning up and easy ingredients that are probably in your cupboard right now. Do I have your attention? I love me some fried donuts but the simplicity of baked beats the oily fried chicken house smell any day. I’m on a lemon recipe crusade right now because of my unlimited supply of free lemons from a friend. Seriously, giant bags full from his tree for the past few months. The kids made $62 on the first lemonade stand of the year and they’re still in school! Summer’s looking green and crinkly for those guys. Savory or sweet, I have your lemon box checked. My lemon donuts start with a recipe that I modified from these maple pecan donuts. It’s a solid recipe and can be changed easily. I really needed to make that strong lemon flavor crystal clear. Man, I hate it when things say they’re lemon but taste le-meh. Fresh lemon juice and heaps of zest took care of that. The frosting has more lemon (shocker) and should be on the thin side. 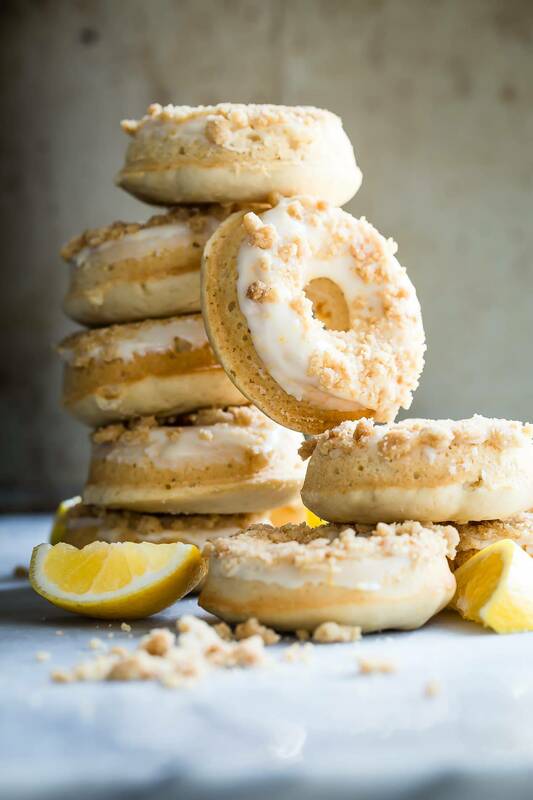 If you notice it becoming stiff or not falling of the lemon donuts when you dip, give it a ding in the microwave and it’ll be brand new for you. Crunchy and buttery are the only words I can think about when I bite into these. If you have any topping left, get a spoon and a bowl of vanilla ice cream and go.to.town. Wait, what if you mixed lemon donuts through some ice cream? Shoot, I already did that! 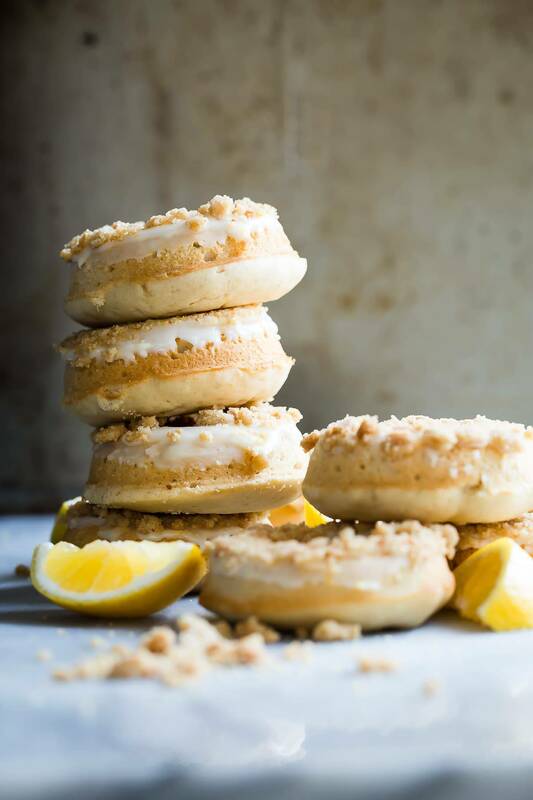 Fresh tasting baked lemon donuts, topped with a sweet lemon zest icing and buttery crumble chunks. Preheat the oven to 350 degrees F. Grease your donut pan with melted butter or olive oil spray to prevent sticking. Using a stand mixer, beat the butter and brown sugar until light and creamy, about 3 minutes on high speed. Add the eggs one at time scraping down after each one and beat until well combined. In another bowl whisk together the flour and baking powder. Gradually add the flour mixture to the batter. Add the vanilla and lemon juice and beat until smooth. Scrape down. Finally add the zest and milk and mix until smooth. 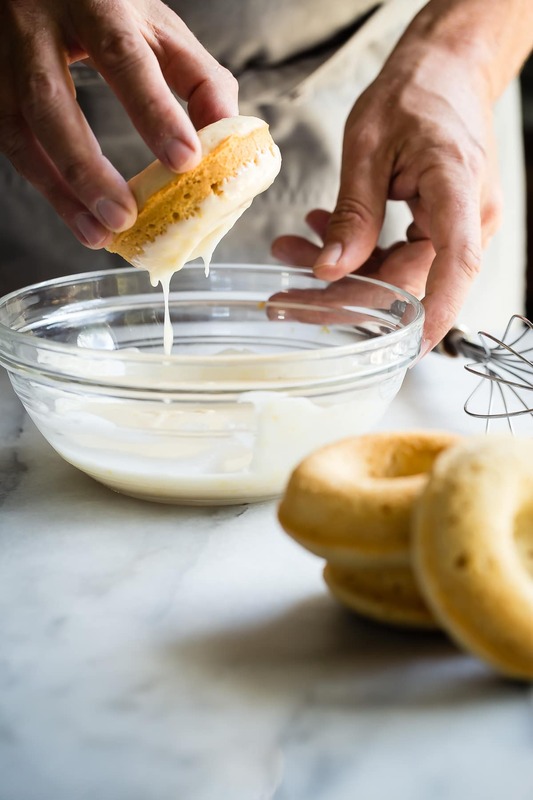 Spoon the batter into each donut space in the pan and bake in the oven for about 12-15 minutes. Let cool for two minutes and then dump them out. Repeat the procedure until all of the batter has been used. In a bowl combine the flour, sugars and butter. Rub the butter with your fingers through the flour until it feels like sand. Lay the mixture onto a baking sheet and bake in the oven at 400 degrees F for about 10-12 minutes. After the crumble has cooled, crush it up with either a knife or your fingers into crumbs. Combine the powdered sugar, lemon juice, vanilla extract, lemon extract, lemon zest and milk in a bowl. Warm the frosting in the microwave for 6-10 seconds repeating if the fasting becomes stiff as it sits. It should be slightly pourable. Dip the donuts into the frosting letting the excess drip back into the bowl and then press them into the crumble mixture. Serve at once or cover and use within a few hours for best results. Crumble topping recipe from Martha Stewart. Lemon flavored pastries are my absolute favorite, so these donuts are calling my name. I am always so jealous of people who have citrus trees growing around them. It’s the one thing we’ll never get here in New England (though, maybe with global warming…) Beautifully crafted, Gerry! Gorgeous!! I too adore lemon flavored pastries!! So excited to make these! Love the flavors, these look magical dude! Gah, these are crazy pretty!! I was in love with these at first sight – and then I saw the topping!! 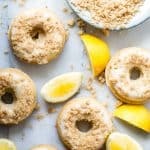 I love that crumble topping, these are my kind of donuts! Dude, I think I need to take lessons from your kids – $62 on a lemonade stand?!?! Also the crumble topping on this is just amazing. Gorgeous! I’ve got some lemon donuts on my blog, but my glaze didn’t come out nearly as good as this one looks. I must try these out. Wow! These look amazing! Love the crumble on top! Thanks Eden, the topping is really good!